Having already tested the Trelock LS 750 ION and LS 950 ION, we come today for Trelock LS 450 test. With this bicycle lamp is an earlier and smaller version of a bicycle headlamp. We look at it directly to the front lamp and taillight. Only with two lamps we have a roadworthy bike. 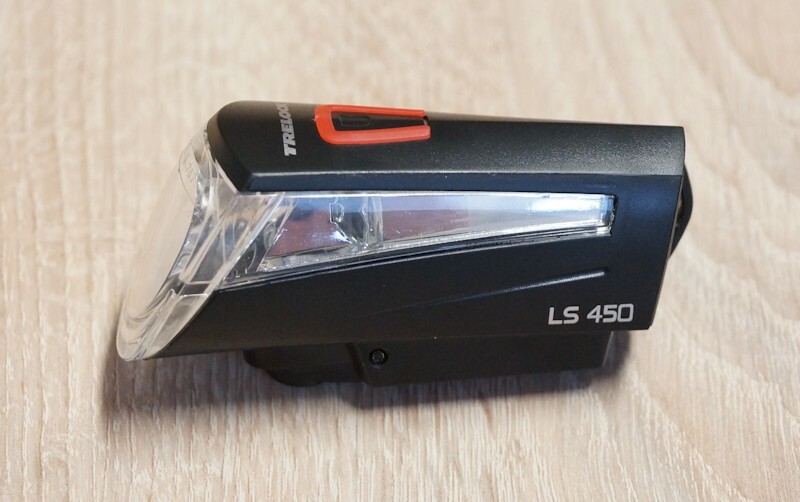 When Trelock LS 450 is a battery bicycle lamp which is powered by 4 AAA batteries or optional rechargeable batteries. 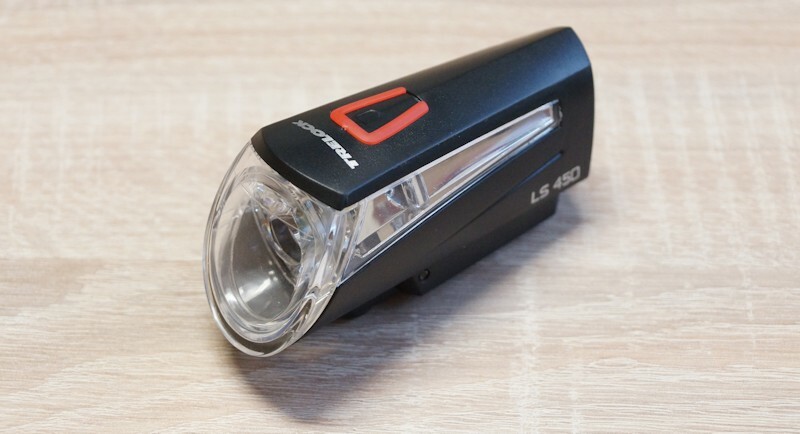 According to the manufacturer, the LS 450 creates from the Sportline a light output of 15 LUX for a maximum of 30 light hours. The LED technology used for acts more power efficient. The package includes the initial supply of batteries is. 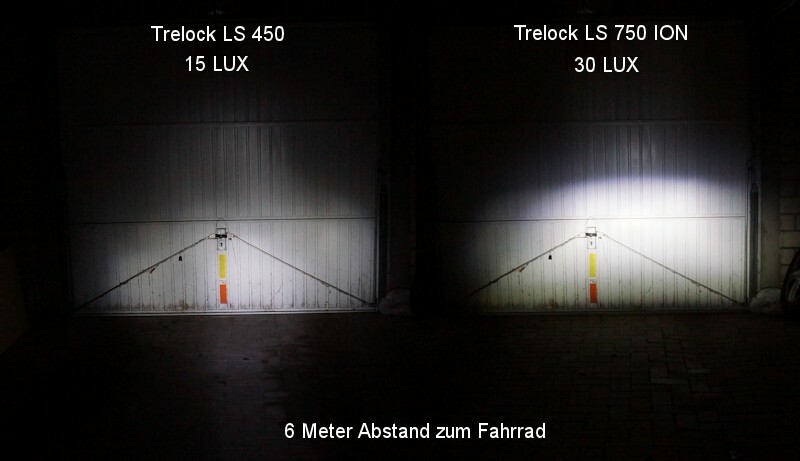 With the 15 lux, the 450-er version of Trelock creates maximum amount of brightness, such as the Trelock LS 750 ION on the lowest setting. Weighing only 114 grams, the battery lamp is very easy. Both lamps come together at a weight of 164 grams, the rear headlights Trelock LS 320 weighs 50 grams so. All weights are incl. The inserted batteries. The processing makes a good impression. The material adapts to the seams together well, is not above or forms unsightly or sharp edges. One has to just open the battery cover and can now replace the battery or batteries. So that this goes smoothly, you have to push the red safety button forward. This button is on the bottom of the lamp, he is seen only when the bicycle lamp is not located at the bracket. The advantage of this, you are traveling, you can get new energy sources and at the petrol station. A ride in the dark is therefore not necessary also to the late hour. Turning on the bike headlight is very easy, just press the button on the top and already she begins to shine. Since there is only one light level in this embodiment, to turn on the lamp just as easily again. The bicycle lamp appears according to the manufacturer about 40 m wide and is seen even up to a distance of 700 meters. As we have now found is the Trelock LS 450 more something for the city and to be seen by others, this is supported by the lateral reflector elements. Here a ray of light output by the LED, the bicycle lamp is also clearly visible from the side. The same principle is also used in the Trelock LS 320 Rear headlights. 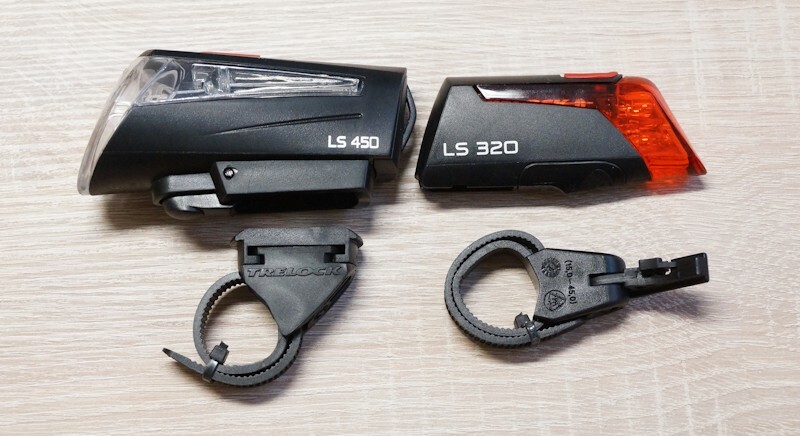 Included is the holder for the LS 450 and the holder for the 320, the rear light. 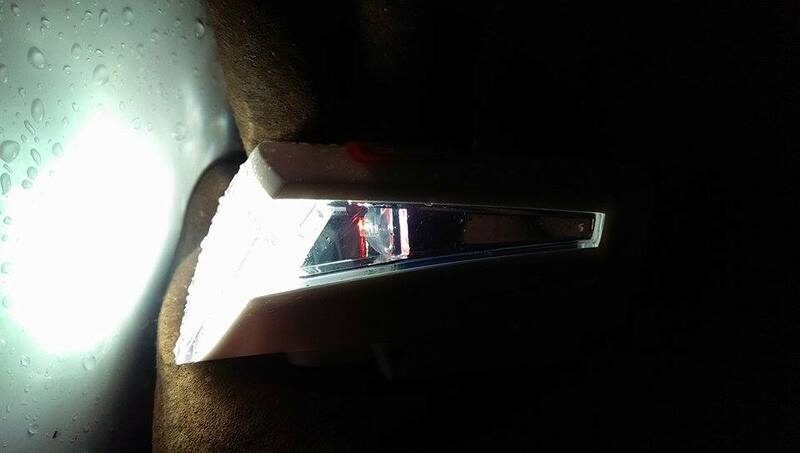 The bicycle headlight has a StvZo approval and may be used on German roads. More bicycle lamps with FR approvals we list in the bicycle lighting test on. The LS 450 Combi-sets you get in white and black, here decides the personal taste. Technically, there are no differences between the two versions. 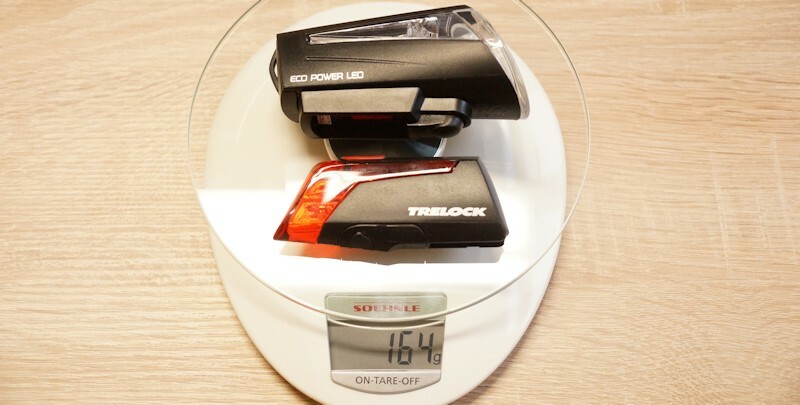 The holder is cultivated simply because Trelock relies on a system that is recover all bicycle headlight, one can use as a holder of an existing lamp. If you have no Trelock bicycle lamp, can watch this video to mount the holder for the 750 ION, the mounting for the LS 450 is equal. At the manufacturer’s attachment: one-hand snap closure — The assembly is intended to work without tools. The link to the Trelock Variotex ® should be between 22 to 32 mm thick. If you want to reorder its holder once, can do so easily. The bracket can be purchased as an accessory under the name ZL 700 TH without air. Those who work in general more often on bicycle, which can have a bicycle repair stand to think. Anyone wishing to use this lamp, thereby should be on the road in the illuminated area. 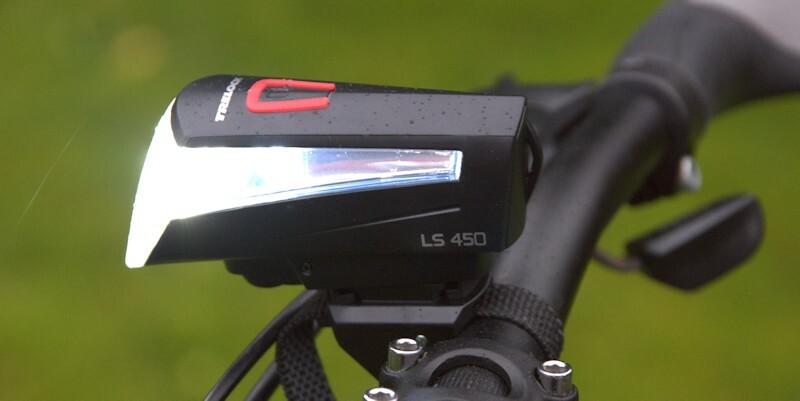 For use in the city or in places where streetlights are installed, the LS is to be easily seen by other road users 450 optimally. In open terrain, in the forest and in dark areas where otherwise there is no lighting, one should resort to a larger model of Trelock or another manufacturer dear. 15 LUX power are very tight, if you want to illuminate a unlit road well. We recommended for use on unlit paths at least 30 LUX. This combo set is ideal for any student , in the city these bulbs are lifted right. For the rather low price of just 34 euros you get here a piece of security to be seen. The taillight is sufficient in any case, even in the forest you will be well recognized by the LS 320 from behind.